Pictured is a similar excavator used for previous dragline ditch rehabilitation projects. 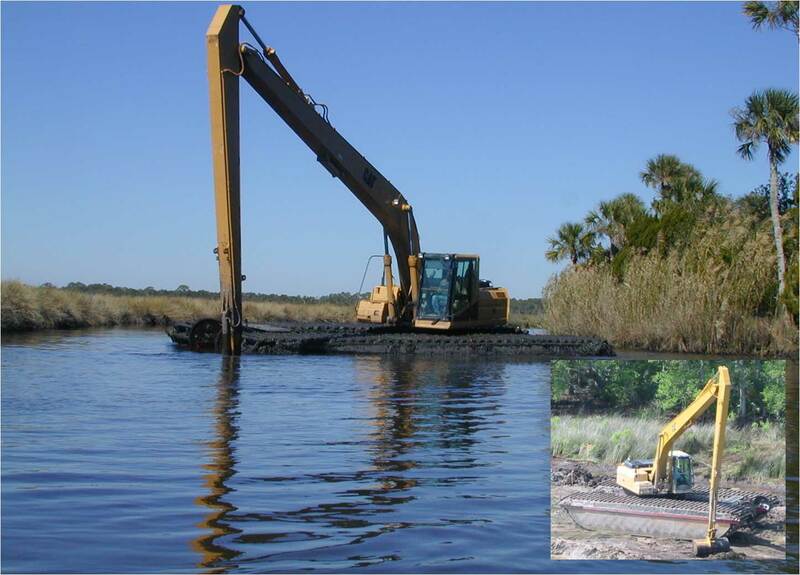 PALATKA, Fla., Jan. 16, 2019 — The St. Johns River Water Management District will offer stakeholders and residents an opportunity to see the “marsh buggy” excavating equipment up close at Gamble Rogers Memorial State Recreation Area in Flagler Beach on Jan. 28 at 1:30 p.m. This excavator is specialized equipment that will be used to return dragline ditch spoil mounds to wetland elevation in the Flagler County Wetland Restoration Project. HOW MUCH: Admission to the park is free for stakeholders interested in seeing the display. The “marsh buggy” is a Caterpillar 320D long-reach excavator mounted on pontoons — a self-crawling, track-driven vehicle that generates only about 2 pounds per square inch of pressure on the ground because its weight is distributed over the entire bottom of the pontoons. Thus, the equipment can move across a wetland without causing damage. Admission to the park is free for those attending the display. Visitors also can see what a turbidity barrier looks like and learn how turbidity (cloudiness or haziness of water when it is disturbed) is tested and see examples of signage that will be posted in construction areas. The Flagler County Wetland Restoration Project is a partnership between the district, U.S. Fish and Wildlife Service, Florida Fish and Wildlife Conservation Commission and Florida Department of Environmental Protection State Parks program. The project will consist of moving piles of spoil back into man-made ditches and grading the material to the elevation that matches nearby remnants of natural wetland. The project will return dozens of acres of ditches and spoil piles to functional wetland that will yield food for fish and wildlife, filter and clean water, and provide other benefits. Existing wetland areas, natural upland areas, and oyster reefs will be avoided. 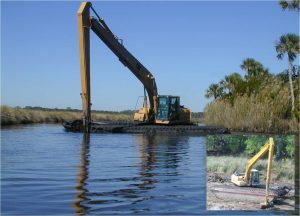 For updates about the project, visit www.sjrwmd.com/facts/flagler-wetland-restoration-project/.